There is a mystery associated with the lake flowing inside the crater, nobody can say how it remains full through the year, a stream feeds this crater but up to this date no outlet was found. The other puzzle is that lake has two distinct regions that never mix, an outer neutral and an inner alkaline region. Both support different flora and fauna. The trek down the lake is really difficult to negotiate and it is always advisable to be cautious before you step because there may be a snake. The uneven surface and the dangerously wet surface of the lake's shore makes the walking quite challenging - a good treat for a trekking expedition. 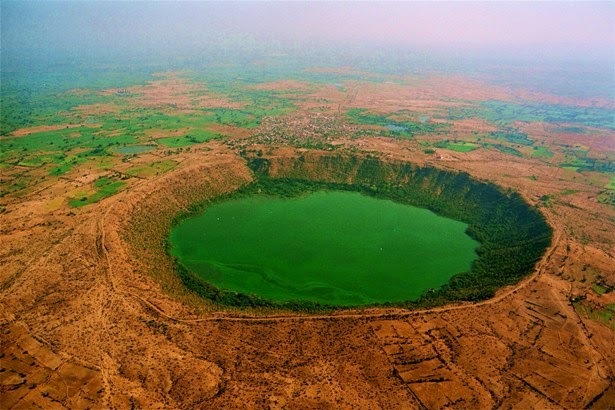 The best time to visit this crater is during winters and time management is necessary as you cannot get down the hill in the scorching sun neither you can trek uphill after the dark. Carry your food along loads of water as it is not available there and climbing back is always tougher. A sculpture on one of the temples inside the crater tells about the formation of Lonar. A demon named Lavansur (in Sanskrit Lavansur means salt) caused trouble to mother earth and one day earth requested the Lord Vishnu to kill the demon. The Vishnu came in the form of child and killed demon with a little damage to earth. Demon went inside the earth and died there. After some time a salt lake formed on the spot and came to be known as Lonar, actually Lavanar in Sanskrit meaning Demon Lavansur. Within the slope of Lonar there are as many as 14 temples and oldest one is 1300 years old.